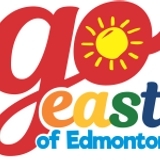 Lougheed ATTRACTIONS & EVENTS Join the village for their Sports Day on May 19. Ride in with your wheels on July 21 as the village is participating in the Lucky Highway 13 Poker Rally. 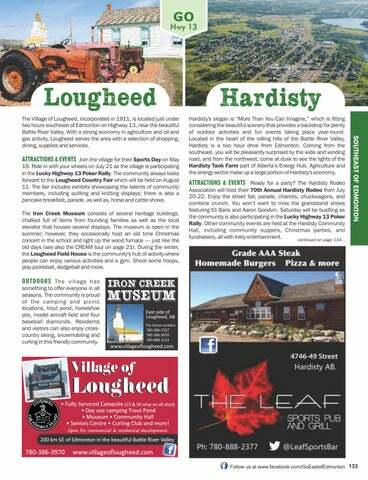 The community always looks forward to the Lougheed Country Fair which will be held on August 11. The fair includes exhibits showcasing the talents of community members, including quilting and knitting displays; there is also a pancake breakfast, parade, as well as, horse and cattle shows. The Iron Creek Museum consists of several heritage buildings, chalked full of items from founding families as well as the local elevator that houses several displays. The museum is open in the summer; however, they occasionally host an old time Christmas concert in the school and light up the wood furnace — just like the old days (see also the CREAM tour on page 21). During the winter, the Lougheed Field House is the community's hub of activity where people can enjoy various activities and a gym. Shoot some hoops, play pickleball, dodgeball and more. Hardisty's slogan is “More Than You Can Imagine,” which is fitting considering the beautiful scenery that provides a backdrop for plenty of outdoor activities and fun events taking place year-round. Located in the heart of the rolling hills of the Battle River Valley, Hardisty is a two hour drive from Edmonton. Coming from the southeast, you will be pleasantly surprised by the wide and winding road, and from the northwest, come at dusk to see the lights of the Hardisty Tank Farm part of Alberta’s Energy Hub. Agriculture and the energy sector make up a large portion of Hardisty's economy. The Village of Lougheed, incorporated in 1911, is located just under two hours southeast of Edmonton on Highway 13, near the beautiful Battle River Valley. With a strong economy in agriculture and oil and gas activity, Lougheed serves the area with a selection of shopping, dining, supplies and services. OUTDOORS The village has something to offer everyone in all seasons. The community is proud of the camping and picnic locations, trout pond, horseshoe pits, model aircraft field and four baseball diamonds. Residents and visitors can also enjoy crosscountry skiing, snowmobiling and curling in this friendly community. • Fully Serviced Campsite (15 & 50 amp on all sites) • Day use camping Trout Pond • Museum • Community Hall • Seniors Centre • Curling Club and more! Open for commercial & residential development.